Youth (Fall 1990) | Reimagine! Welcome to our third issue of Race, Poverty & the Environment. 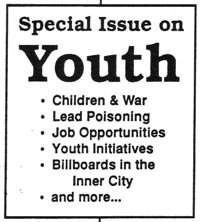 This issue is the first of our theme issues, with the topic being youth. We have tried to pull together articles and resources that explore and analyze race, poverty, and the environment as they apply to children and youth, to examine the ways that children are most vulnerable to environmental hazards, and to show ways that children are in the forefront of responding to this nation's environmental crises. We think - not immodestly - that this issue showcases the diversity of approaches to environmental problems.